On Tuesday, June 14th, the country music community will unite to assist victims of the tornados that ravaged Alabama on April 27th. 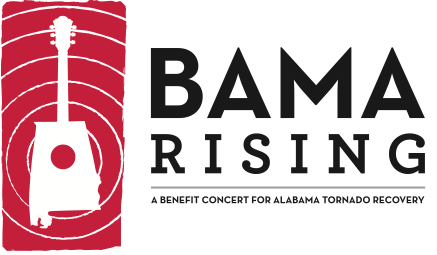 “BAMA RISING: A Benefit Concert for Alabama Tornado Recovery,” presented by Verizon, will take place at Birmingham’s BJCC Arena. It will feature performances by ALABAMA, who is spearheading the event, Brad Paisley, Sara Evans, Sheryl Crow and numerous other artists. See below for a list of performers and special guests who have been confirmed to date. The Bama Rising Fund has been established at the Community Foundation of Greater Birmingham to support long-term recovery statewide in the wake of the April 2011 tornadoes that devastated Alabama. Decisions about how to deploy Bama Rising concert proceeds and gifts to the Bama Rising Fund will be made by an advisory committee including representatives of the artists, promoters and the Community Foundation. In addition to ticket sales, funds will be raised through corporate sponsorships of the event. For information on becoming a corporate sponsor, please contact Jay Wilson at Red Mountain Entertainment – 205.585.2531 or jay@redmountainentertainment.com. Tickets will go on sale to the general public this Friday, May 20th, at 11:00AM CST at www.ticketmaster.com. Ticket prices will range from $25 to $150. VIP packages will also be available. Visit www.bamarising.org for more details. Bama Rising is presented by Red Mountain Entertainment and AEG Live/The Messina Group. Corporate sponsors include Verizon, Bravado, Zeekee Interactive, Bill Young Productions, Tour Design and Ticketmaster.